"Everything old is new again" ... the slogan of the manufacturer 8Bitdo hits the nail on the head once again for the 30 years of the "Super Famicom" (known herein as "Super Nintendo "). Far-famed for its adaptations of retrogaming controllers, 8Bitdo declines its new controller Blutooth SFC30 with an anniversary edition which will delight the nostalic ones of the flagship console of the 90'. With its additional Xtander phone stand, it is possible to combine un smartphone with the gamepad as a portable console to be able to take full advantage of NES, SNES, GBA, Game Gear, Master System, Mega Drive, Nec PC Engine, Neo-Geo, Arcade emulators as well as platform games on mobiles. Equipped with Blutooth 2.1 technology, this wireless controller is compatible with Android™, iOS™(iCade), MacOS™ and Windows™ systems. 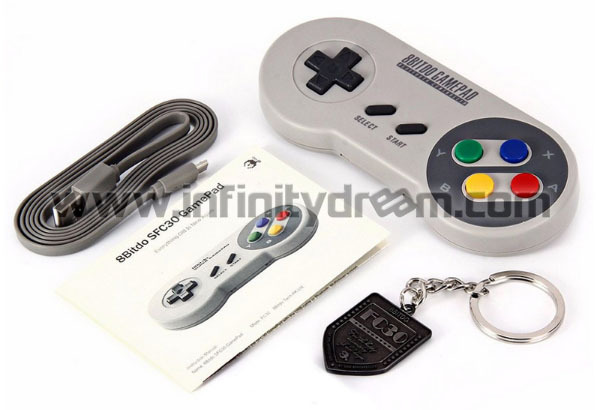 A micro USB charging cable and a key ring "FC 30th Anniversary" are included in the box.